Dave deBronkart and I met several years ago through patient advocacy and online connection points, and I’ve followed his health story as he has simultaneously followed mine. Dave comes from the perspective of a cancer survivor who almost died and has turned his “free replay in life” into a crusade to open healthcare’s minds to the idea of partnering with patients. So when he messaged me to tell me that his lab results for A1C came back a little elevated, I watched our health stories smash up for the first time. Nothing like the experience of trying to change an A1C to bring people together. WHAT?? I. Am. Not. A. Diabetes. Person. Those people are Kerri, or Amy, or Dana, or Manny, or Scott, or Eric, or Dominick. It’s all those people I like and respect and enjoy knowing, but it’s not me. I mean, they’re not me. I’m not them – they’re a special class. What? I mean, I’m a kidney cancer guy, not an insulin problem guy. I don’t even know what that is, really. And I certainly don’t know how to do it. What to do? Back then I got it in gear, doing what I could despite bad odds, and I was one of the lucky ones, aided by a great online patient community, which my oncologist said (in the BMJ!) he thinks helped save my life. So, what to do this time? My PCP told me about a diabetes prevention program run by the YMCA that reduces by 58% the odds of ever developing T2D, if you lose x% of your weight and get 150 minutes of activity every week. I’d have to pay for it – a few hundred bucks – but it seems worth it. 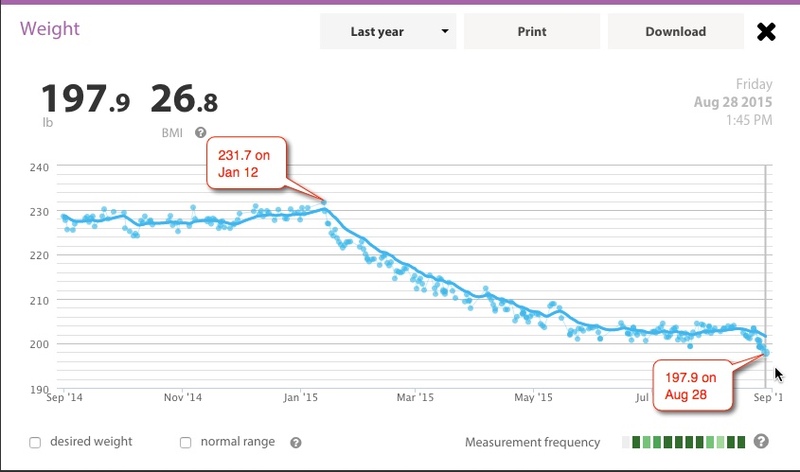 And boy has it been effective for me – check the graph from our wifi bathroom scale. (My results were not typical!) I lost 30 pounds in four months (January to May), dropped a few more to 197 in August… I’m back up over 200 now but I’m also a gotta be active guy … first time in my life I’ve felt I have to get outside and move around. It’s really a lifestyle program – they teach what I’d call food awareness, but it’s really not a diet. They have you count fat grams, with a book or an app or whatever, but that’s no diet. Then later they get into some more detail. But it’s not complicated. And they have you get active – no particular exercise regimen, no in-your-face smiling Sweat Coach. Plus, the effing stupid program isn’t available to people who aren’t yet officially pre-diabetes! It’s a good program, and my wife wants to do it too, but they won’t let her in because she’s not almost in trouble! What the !@#@! are these people thinking, not even letting someone buy their way into this course? And you know what else? When I measured my A1c again in September, it was up … it was worse. 5.9. So now I’m in the middle of trying to educate myself about that. Do you have any idea how hard it is to find out what to do about that?? Well, I imagine you do know. I’m here to say, for sure, that although T2D is different from T1D, it’s clear to me that the system (whatever that is) sure doesn’t make it easy for us to do the right thing. Here’s to a radical acceleration of the tools we need – driven by what patients say they – we – need! And I’m not even T2D yet – I’m just frickin annoyed at how I can’t even get clear instructions on what I should be doing about it! I believe health goals should be patient-driven, and the C word (“compliance”) should be thought of as achievement. So why can’t I get good guidance on that?? Health goals should be patient goals, and there needs to be clear guidance on how to achieve them. Thanks for lending your voice here today, Dave. Guest Post: #SpareARose and Symplur. Guest Post: Diabetes Isn’t Easy, But Acting on Policy Can Be. Guest Post: Diabetes at Work. Guest Post: Adventure D!! Not What She Thought I Was Doing. What can I say … I’ve become a firm member of the “We’ve GOT to be able to do better at this” club. Power to the DOC! Thanks for being the voice, Dave. And my insurance won’t pay for a CGM because my diabetes is “under control.” Which, for the rest of us, still means crabby highs and popping glucose tabs for sweaty lows on a weekly basis. Thanks, but I’m certainly not “the” voice … for years I’ve pointed to the PWD community as the archtypical “engaged patients” because the stuff hits the fan anytime you’re not. How much does a CGM unit cost, to purchase and monthly, or however they do it? How do other countries (outside the U$ healthcare system) handle such things? “I found the key to lowering my fasting blood sugar and a1c was complete avoidance of all added sugars and all starches where the fiber had been processed away. “So no sugar in my tea, no white flour, no white rice, no mashed potatoes unless the peel was included…. I share your frustrations with our healthcare system! I have type1, for 39 years, and have learned a great deal about how diet affects both types of diabetes. It’s important to learn how many carbs are in your food, and limit them – especially as above, anything processed and high glycemic (pasta, bread, crackers, potatoes, pizza, desserts…etc). This doesn’t mean eliminating, but becoming more aware and slowly reducing. Eating whole food, with a variety of colors is a great way to keep it simple! Hope your next A1C is down, and you’re feeling great! And your wife can join in with your new ways of eating…Congratulations on the weight loss and exercising more! that’s a huge accomplishment in itself, and will likely improve your overall health, no matter what your A1C. Hi Lucia – I just found this note today – thanks for your useful and thoughtful advice! I’ve been Type 1 for 37 years. A year and half ago on my own initiative, I started eating very low carb – 30g per day – meaning I now eat primarily vegetables and protein. Lucia is right: low-carb may seem limiting at first, but it’s actually a way more interesting diet, and it greatly reduces hunger cravings. And if you like desserts, making them with liquid Stevia, Swerve and almond flour really cuts carbs without sacrificing the taste: check our sugarfreemom.com for super low-carb recipes. Low-carb in my experience is the best strategy for managing of Type 1-, 2- and pre-diabetes. But it seems that most diabetes doctors don’t advocate low-carb. Again, I did this on my own initiative before discovering “Dr. Bernstein’s Diabetes Solution”: he is the ultimate advocate for all types of diabetics. He has recommended low-carb for decades (he’s been Type 1 for 70 years – with no complications). I’ve read his book numerous times, experimenting with all his advice, really refining the management of my diabetes. I highly recommend Dr. Bernstein’s book. I now feel like I did when I was 10 yrs old . . . when I wasn’t diabetic: my HgA1cs are now in the 4s without hypoglycemic episodes (the same as a non-diabetic), I’m no longer chronically tired and foggy, I’ve reversed my complications, I’ve lost 20 lbs and am still losing more, I can now exercise with way more stamina and strength, and I’m motivated to do better. I feel great eating low-carb – I’ll never go back. Good luck, and thank you for sharing your experience and reaching out. David, I don’t know how I missed this comment 7 weeks ago, but thanks for it. I’m learning more about T2 … my weight is still stable (i.e. NOT dropping more), and I wanna get it down! Might explore this.